Chrome Plated Steel Grinding Media, 3/4"
Approximately 3/4" diameter, heavy chrome plated Steel Ball Bearings for use in larger Ball Mills. 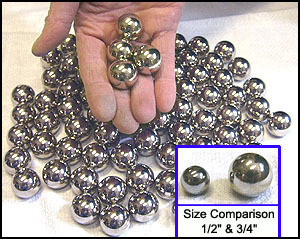 Same as our smaller chrome steel balls, only larger in diameter. Increased grinding efficiency due to greater mass. For maximum grinding efficiency, the large Chrome Steel Balls can be mixed with the smaller ones. Recommended for 12 pound mills and larger, although 3 or 4 in smaller 3 & 6 pound mills will produce more aggressive and faster grinding.